Andis makes the best overall clippers for grooming your dog in 2019. These clippers hit all the necessities: quiet, easily maneuvered, powerful. Plus it has multiple speeds and is easy to grip. Read more about the ﻿﻿Andis EasyClip Pro-Animal 7-Piece Detachable Blade Clipper Kit below. Why Can’t I Use Human Hair Clippers on My Dog? Are you looking for the best clippers for grooming dogs? If so, then you’re in the right place. 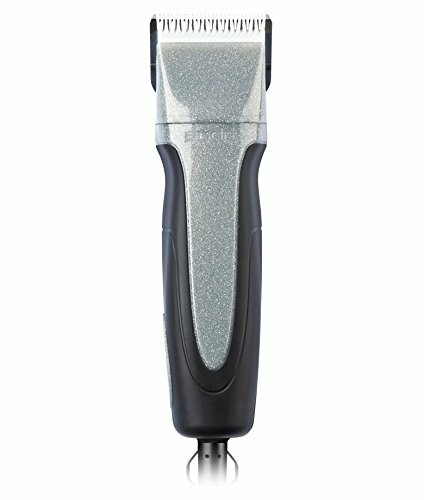 I’ve compiled a list of the 5 best dog clippers you can buy. I’ll give you a rundown of the features to look at so you can make the best choice for your situation. There are a few reasons you would be searching for grooming tools for dogs. You could be an aspiring pet groomer, looking for the best tools to purchase for your blossoming business. You could be a dog parent who is tired of shelling out $40 (or more!) on a grooming appointment every month. You could be a dog parent who is reluctant to force your terrified pup to the groomers. Or you could be like me! I have a dog that needs so little in the grooming department, it seems a shame to take her to a place she does not like and pay a considerable fee for a little trim. I have a Toller. All she really needs is a trim around the ears and paws and her nails clipped. I can do all of that by myself with the right tools. No matter your situation, we’ll help you find the best professional dog clippers for you! Grooming your dog at home has wonderful benefits for you and your pup. It will easily save you money in the long run. Clippers can be a little expensive, but often times pay for themselves in 2 sessions! And your dog will appreciate the comfort of being at home. You already have established trust in your relationship and that will make your dog much more relaxed than a stranger in a strange place (ie the groomers). It’s even a great bonding experience! When you’re choosing dog grooming clippers, you must keep your particular situation in mind. 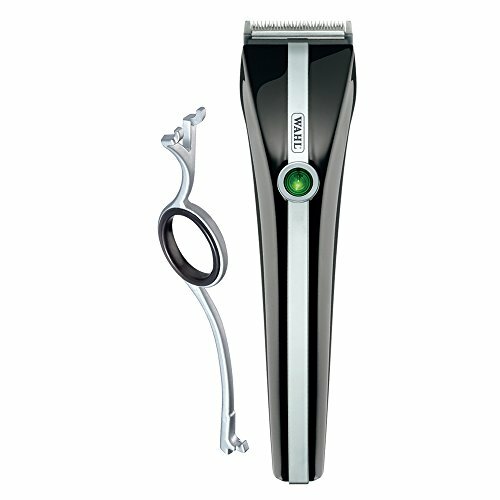 There are many factors to take into account and while one set of clippers may be best for me, they may not be the best for you. The features to keep in mind are: corded vs cordless, speed, size, noise, and blades. We’ll discuss these more in-depth later. What you should have in your mind now is your dog and her grooming needs. What is the texture of her coat? Is it soft like a poodle, a pomeranian, or a golden retriever? Or is it coarse like a german wirehaired pointer, an airedale, or a scottish terrier? How much will of your dog’s fur will you cut off? Does she just need a trim or is it a bigger job? A dog with a thicker coat will require more powerful clippers. While there are many choices out there, the best quality and most widely discussed dog clippers are made by either Oster, Wahls, Andis, or Laube. They are all reputable brands and make quality products. The challenge is simply in finding the best clippers for your needs. Earlier, I briefly mentioned some features to keep an eye on. These include corded vs cordless, speed, size, noise, and blades. Let’s take a closer look at each of these and maybe a few more for good measure. There are benefits and drawbacks to both the corded and cordless options. The cordless dog grooming clippers are easier to maneuver so you can be confident about getting those hard-to-reach spots and doing a good job. They are a great option for beginners who perhaps have a lighter grooming job to do. The cordless options are slower and aren’t preferable if your dog has a very thick or coarse coat. On the downside, the battery will run out, usually after about an hour, and you will have to either replace the battery or recharge the unit, which takes time. The cordless also tends to cut weaker the longer you use it. In contrast, the corded options can be harder to maneuver and get all the hard-to-reach spots. But they do offer more power and an even cut over the grooming appointment. If you are a groomer or starting a grooming business, you should start with the corded version. You won’t have to deal with a weak cut or battery changes/charges. As your business grows, you can add cordless clippers as well for the finer touches and hard-to-reach places. To put it simply, if your dog has a soft coat that isn’t too thick, go with the cordless to get the maneuverability. Otherwise, spring for the corded version for the power you need. The speed of grooming clippers is called the rotary speed per minute. There are two options: single-speed and variable-speed. This is what determines the ease at which the clippers will work through mats, knots, and coarse fur. The single-speed option is the best choice for beginners as it doesn’t heat up as quickly. The variable-speed option allows the user to switch from a base speed to a higher speed to work through the tough mats and thick, coarse fur. Variable-speed gives you more control and provides the best finished look. The size and weight of the clippers should always be on your mind. The best dog clippers will be light and compact enough for you to easily maneuver them around your dog. The good news is that these days, all the best brands have taken comfort into account and have created ergonomic designs for this reason. So, while this feature is probably already taken into consideration, it still should be on your mind. Motor noise is another factor that most likely has been taken into consideration by reputable companies, but it’s still something to look at before committing to a purchase. Some dogs are unfazed by noise. If that sounds like your dog, then you don’t have to take noise into consideration. But if your dog is like mine and jumps and barks at every new noise she hears, it’s best to look for a quieter option. Be aware of and sensitive to your dog’s comfort. There are a few things to consider about the blades of the best dog clippers. First is compatibility. Some brands use interchangeable blades and some brands use specific blades that only fit their clippers and are only made by their manufacturer. These days most professional brands, like the ones featured in this article, use snap-on, interchangeable blades. For example, you could use Andis blades in Oster clippers. This is convenient if you happen to like one brand for clippers but a different brand for blades or if you are grooming multiple dogs of differing coats. You can just change to the preferred blade between dogs, instead of having another entire set of clippers. Second is the quality and material of the blades. In the past few years, blade quality has come pretty far. The blades are generally made from stainless steel, ceramic, or a combination of those two. They can also be infused with different materials for different results. For example, some blades are infused with carbon, which gives them a harder edge for a cleaner cut. Some blades have a chrome finishing, which makes them more resistant to rust. Some blades contain silver, which acts as an antibacterial and antifungal agent. And ceramic helps the blades stay cooler for a longer period of time. These features appear in the different edging varieties. Ceramic Edge Blades: These are designed to stay cool and keep an edge. Show Edge Blades: These have a special coating that gives a smooth, sleek finish. Ultra Edge Blades: These are made of steel that is infused with carbon, which makes them harder and last longer. Third is skip tooth versus finish cut. The skip tooth blades are great for heavy duty work. They will plow easily through knots, mats, and thick, coarse fur. In contrast, the finish cut blades have trouble with mats, but will leave a gorgeous finish! Fourth, know your blade number! Choose your blade number based on how long you want your dog’s coat to be. The lower the number, the longer the fur will be post-grooming. Remember, the blades do need to be replaced periodically. The more often you use the clippers, the more often you will need to change the blades. Always remember to read the booklet that comes with your clippers and follow the care instructions. If you fail to maintain them properly, the teeth will become dull and you will find that the clippers are missing strands of fur or cutting unevenly. Oils are often used in the care of dog clippers so check what is recommended in the instruction booklet or on the manufacturer’s website. Combs are a wonderful accessory to professional dog grooming clippers. They snap onto the clippers and come in various sizes and materials. You can’t really go wrong here. Choose combs that are compatible with the type of coat of your dog. Try a few and see what works best for you. There are usually up to 10 in a set, but you will only use a couple of them. Remember to check the width of the blade and head of the clippers. It must be a perfect fit for the comb to snap on easily and stay on. That would be a cheap and easy solution, but unfortunately, it wouldn’t work out very well. Even if your dog has a thin coat, it is still much thicker than the hair your human hair clippers are designed for. Your poor human clippers will be overwhelmed. Dog clippers have more teeth per blade. They are designed to handle the thick fur of dogs! The blades of your puny human hair clippers will dull quickly with such a big job. You could change the blades frequently, but even then you run the risk of burning out the motor or even burning your dog! She can’t tell you when the clippers are starting to feel too hot. Dog clippers have stronger motors and the necessary cooling systems to prevent overheating. Now that you know what to look for, here are the 5 best clippers for grooming dogs. I’ll include descriptions and explanations of what makes them great products. These clippers are my favorite! They are seriously amazing. They are corded, but still maneuver fairly easily. I prefer the corded overall because they quality and consistency of the cut is so much better. They are 5-speed so you can easily switch between the normal speed and the higher levels, which will allow you to smoothly cut out those mats and knots.The blade is detachable so you can choose the perfect blade for your dog’s coat and switch blades if you have more than one dog to cater to. 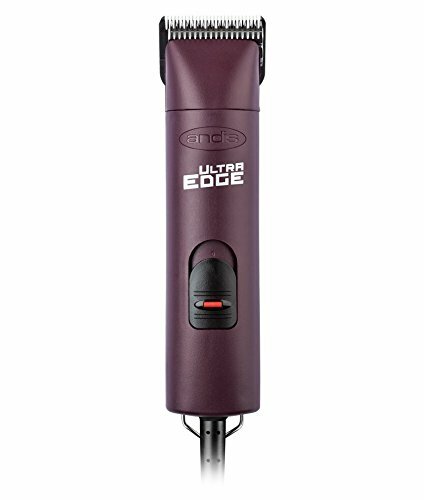 It will fit Andis, Master Grooming Tools, Oster, and Wahl detachable-style blades so you have plenty of choices! The blade stays cool for awhile and the motor is very quiet. It’s perfect if your dog is easily startled. They have a soft-grip and are anti-slip for ease of use. The power supply is at the plug, which makes it easier to handle and cooler to run. Andis itself is a great company that makes quality products. It comes with a 1-year warranty. I highly recommend these clippers! Are you looking for smooth, easy maneuverability? Look no further! These clippers are light and powerful. They have a removable scissor grip for easy use. With no cord, it boasts 90 minutes of operation without recharging. These clippers make very little noise and have low vibration so they are comfortable to use for long periods of time. They are perfect for those tight, hard-to-reach places, like the face, ears, and paws. I love this one for my dog as she is low-maintenance when it comes to grooming, but I can easily maneuver around her paws to prevent fur-foot (the bane of her and my existence)! If your dog has a thick and/or coarse coat, you might want something a little more powerful. These clippers are perfect for small- to medium-sized grooming jobs. The blade is adjustable so there is no need to purchase different sizes as one click will give you the depth you desire. Looking for power? These clippers are for you. They are 2-speed so they aren’t as variable as a 5-speed, but they don’t need to be. They still give you the option of a base speed and something that will cut through the tough stuff more easily. They are corded, which means a little less maneuverability, but that’s a sacrifice you have to make if you want this kind of power! 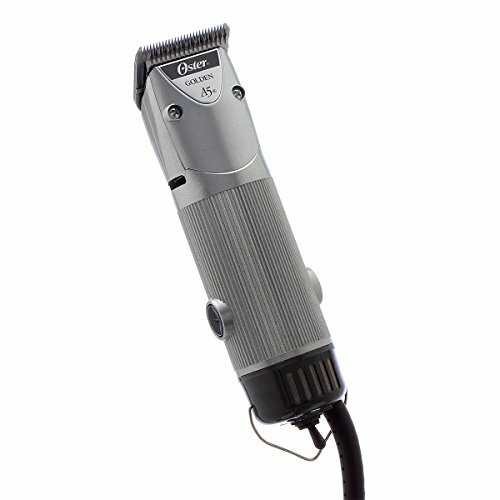 These clippers are surprisingly quiet and stay cool for longer that you would expect at such high rotary speeds. If you want to shave your pup quick, then these are the clippers for you! The blades are detachable for easy cleaning and easy changing if you want to use a different blade. It would will all UltraEdge, CeramicEdge, and ShowEdge blades, as well as Oster A-5 blades. You have options! Looking for something simple and straightforward, but great quality. These Oster clippers are a great choice. They are single-speed so there are no frills here. They have a powerful motor and work will all different coats. The blades are detachable for easy cleaning and are cryogenically treated to enhance the hardening process for extended durability. They will last you a long time, even with a tough coat. They are corded so have less maneuverability than cordless clippers, but that means they have more power! There is an internal fan that works to keep the unit cool for extended use. If you take care of these clippers, they will last for a long, long time. Oster boasts that these clippers can handle everything from general purpose grooming to precision clipping and their customers agree! These are just an all-around, great product. These clippers are made for the average joe at home with a dog that has an easy-to-groom coat. They are less expensive than my other recommendations and (though it isn’t always true) in this case the difference in price means a difference in quality. These clippers (and all other clippers in this price range) are of inferior quality to clippers mentioned above. If you can afford it, I highly recommend spending the money and buying higher quality. Remember, they pay for themselves after a few skipped trips to the groomers! That being said, these clippers are the best cheap dog clippers. They will get the job done for dogs with fine to medium coats. If you want something to try out just to see if you like grooming your dog yourself, this is a great choice! They will give you a feel for the task. Like the Wahl Motion, they come with an adjustable blade so you don’t have to worry about getting the right size. This is also a kit, so you get all sorts of other fun supplies and an instructional DVD! These clippers are quiet and easy-to-use. I would recommend to always use the attachment combs as it’s easy to nip your dog’s skin if you are giving her a close cut! Well, there you have it! Those are the best dog clippers on the market if you ask me. I hope you found this article helpful. At ReadySetDogs, we are eager to help you provide excellent care for the furry members of your family. If you have any questions or comments, feel free to comment below, or send us an email through our contact us page.